At Broussard & Hart Personal Injury Attorneys in Baton Rouge, Louisiana, we focus on one thing and one thing only: helping those throughout our region who are suffering needlessly from the negligent, careless or unlawful acts of others. To that end, our law firm offers unmatched advocacy and representation in all areas of personal injury law. To date, we have secured more than $100 million on behalf of our plaintiff clients over the past 30 years. Staffed with a team of some of the most highly rated and talented trial lawyers in the country, our law firm has three offices across southern and southeastern Louisiana. We have helped thousands of individuals and families recover the maximum amount possible for the damages and losses they incurred as well as for their pain and suffering. When you choose our law firm, we will assess your case to determine if you have a viable claim. If so, we will first try to negotiate a settlement with the insurance companies. If we cannot reach a settlement or if the amount is simply too low, we will fight hard on your behalf in court to help you achieve the justice you seek. 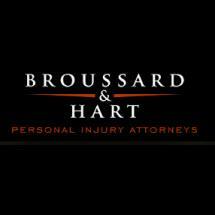 Whether you suffered an injury yourself or lost a loved one due to a preventable tragedy, you can rely on the award-winning counsel at Broussard & Hart Personal Injury Attorneys to help you protect your rights and interests and secure the finances you need to support yourself and your family. For more information concerning your claim and to begin receiving the personable and compassionate support you need during your difficult and uncertain time, you can contact our law office to receive a free case evaluation.